Legislator "Dr" Elizabeth Quat has not one but three "degrees", including her doctorate, from a defunct degree mill once run out of a bungalow in Hilo, Hawaii. We also look into the characters behind it. "A Member should ensure that the personal information (e.g. qualifications) he provides to the Council (including the Legislative Council Secretariat) is correct and true." Ah yes, Greenwich University, Hawaii. We can tell you a thing or two about that. In no way is it related to the legitimate University of Greenwich (formerly Thames Polytechnic) in England. Greenwich University, Inc. (GUI) was incorporated in Hawaii on 2-Feb-1990. It never received any accreditation from an accreditation body recognised by the US Department of Education. That makes it a degree mill by our measure. Its officers included Marjorie Fishman, Pauline Butler and one "John Walsh of Brannagh" (John Walsh). It operated out of this bungalow at 103 Kapiolani Street, Hilo, Hawaii, then home of Douglass L Capogrossi, President of Greenwich University (yes, that's Douglass with two esses). Quite pretty, we are sure you will agree - but it doesn't look like the head office of a university, distance-learning or otherwise. Another entity with the same officers at the same address was United Pacific Corporation (UPC), incorporated on 2-Apr-1990, 2 months after GUI. UPC had multiple trade names including United Pacific University, Sterling School of Business, Pacific International University, Greenwich University Centre for European Studies (from 22-Oct-1991) and "Greenwich University" (from 22-Jul-2003), all of which have expired. The last filings for both GUI and UPC were in 2003 and they were involuntarily dissolved after 3 years of delinquency. By the way, on 4-Mar-2014 we asked Ms Quat's office for the title of, and a copy of, her doctoral thesis, or where one could be found. Nothing has been forthcoming. After Ms Quat obtained her "degrees" from Hawaii, in 1998 Greenwich University moved to Norfolk Island, an external territory in the Commonwealth of Australia, which since 1979 had been allowed a higher degree of autonomy, so to speak. In the 2011 census, the island had a population of 2302 people, of whom 78% were residents. Many can trace their heritage to mutineers of The Bounty, whose descendants settled from Pitcairn to Norfolk Island in 1856. Prior to that it had been a penal colony. According to his own biographies on Linked In and the Victorian Bar of Australia, John Walsh has been "Chancellor Emeritus" of Greenwich University since 1989 and President of Norfolk Island Bar Association since 1994. We have been unable to locate any other members of that association, nor a web site for it. John Walsh has also been appointed to various Norfolk Island positions, including as a senior member of the Administrative Review Tribunal and as deputy chairman of the Gaming Authority. In 2004 elections he was nominated and ran unsuccessfully for the 9-member Norfolk Legislative Assembly. He also calls himself the "Duke de Ronceray Sir John Francis Patrick Cyril Colclough Walsh of Brannagh" and "Marquis de Segre, Count de Bauge et de Fontevrault, Viscount de Fontevrault, Baron de Beaufort". Honestly, we don't make this stuff up. As part of the migration from Hawaii to Norfolk Island, a company, Greenwich University Pty Ltd (GUNI), was registered under the Norfolk Island Companies Act. GUNI persuaded the Legislative Assembly to pass the 2-page Education (Greenwich University) Regulations 1998 (GU Regulations), and these were quickly upgraded to the nearly-identical Greenwich University Act 1998 (GU Act), which was assented to by the island's then Administrator, Anthony John Messner, on 9-Dec-1998 pursuant to Section 21 of the Norfolk Island Act 1979. Prior to that, the Hansard records only the briefest discussion, in the assembly on 16-Sep-1998. There was no academic accreditation process for this enactment, and the external Territories of Australia, including Norfolk Island, were not subject to Australian federal education policy, a loophole that was not rectified until 2002. So GUNI never appeared in the Australian Qualifications Framework register and as such, did not have Australian academic accreditation. On 2-Dec-2002, the Federal Government of Australia enacted the Higher Education Legislation Amendment Act (No. 3) 2002, to regulate the use of the title "university" and the delivery of higher education in the external Territories. This overrode the GU Act, which no longer has any effect, although it remains on the Norfolk Island statute book. As a result, rather than seek to qualify, GUNI shut down. The Internet Archive contains a copy of the GUNI web site at greenwich.edu on 24-Apr-1999. According to that, "Chancellor" John Walsh states that his Juris Doctor and PhD in International Law were earned at Columbia Pacific University, another defunct entity that operated without USDE-recognised accreditation. The GU Regulations and GU Act both mention an earlier entity, the International Institute for Advanced Studies (IIAS). This is a non-profit corporation incorporated in Missouri, USA on 26-Jul-1973 and known until 17-Nov-1978 as "Occidental University of St Louis". The GU Regulations and GU Act provided for GUNI to "undertake on Norfolk Island the administrative and academic functions of" GUI and IIAS. The Texas Higher Education Coordinating Board (CB) has a list of institutions whose degrees are illegal to use in Texas. Against "Greenwich University" of Hawaii, Norfolk Island and California it notes "No accreditation from a CB recognized accreditor. Closed by Australian Government." And what about Douglass Capogrossi? 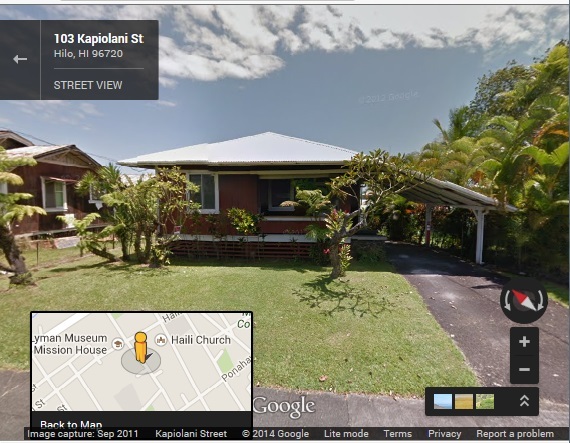 He is now President of another institution, Akamai University, incorporated in Hawaii on 30-May-2002, just months after GUNI shut down, with galactic headquarters at 187 Kino'ole Street, Hilo (see it here). Akamai University is not accredited by a body recognised by the US Department of Education. And here they are on YouTube in Penang, Malaysia, at the 2013 "Commencement Ceremony". You can't keep a good man down.